On December 19, 2014, Oregon’s Mt. 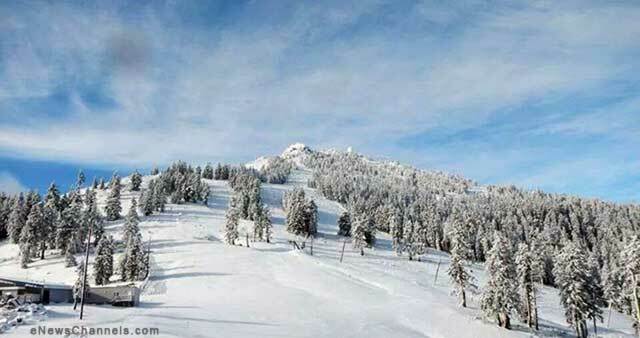 Ashland ski area opened after welcoming the biggest Pacific Coast storm in five years. It happened after their “First Snows Mountain Blessing” ceremony on November 23, which contributed to ending the Pacific Coast drought, which had prevented them from opening last season. They had already been blessed with gentle snow on Thanksgiving after leaders of diverse cultures and traditions called in the snow clouds to give them and Mother Earth gratitude in beautiful songs, chants and prayers for their first blanket of snow. A Native American called in nature and ancestral spirits with his drumbeat mimicking the heartbeat of Mother Earth, which echoed again through their magnificent mountain cathedral. Then, two weeks later, a winter storm drenched the Pacific Coast and covered Mt. Ashland with a beautiful bright blanket of powder, as shown below. 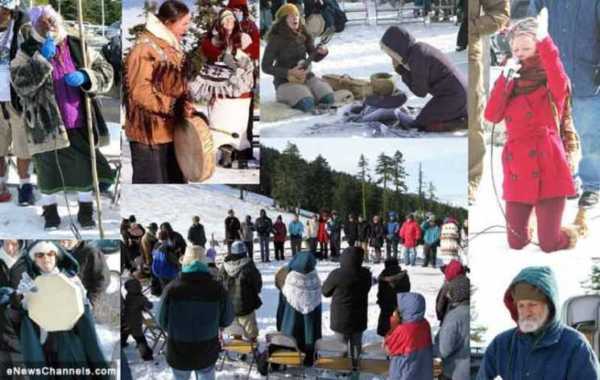 This renowned Arts community nestled at the base Mt Ashland, the highest peak in the Siskiyous of southern Oregon, has been leading mountain blessings and snow gratitude ceremonies for the last eight years to close their season. “After last year’s dry winter when the ski area couldn’t even open, we feel it is especially important to honor the mountain now,” said the organizer Robert Brothers, a local environmental activist. PHOTO CAPTION: “First Snows” Mountain Blessing at Mount Ashland ski area on November 23. Clockwise from bottom left: Nancy Bloom, Naomi Kerongo, Devon Strong, Peia Jessyka Luzzi, Zahira Clement, and Larry Morningstar. Photos courtesy of Mt. Ashland Ski Area, except photo of Devon by JD Anderson of Ashland Daily Tidings. Collage by R. Brothers. In solidarity, my chief advisor, Cherokee Grandmother Moccasin Trail (Olivia Ellis), and I were with them in spirit by phone to help our friends in Oregon, California and Washington. We sent prayers blessing this truly multi-cultural community led by “Bobcat” Brothers, to help heal Mother Earth’s heart. Like Bobcat, Olivia’s poetic descriptions of Nature moved me to imagining the tribal Ancestors and Nature Spirits dancing up a storm! So many have also been praying in solidarity for this gift from heaven that is “bringing the most rain from a single system in about 10 years in California,” reported Accuweather.com. While there is unfortunate “flooding in poor drainage areas,” they said that other flooding was prevented by the waters refilling empty reservoirs and replenishing water tables and aquifers. The storm also gave thirsty people, Agriculture, Nature and animals a big life-saving drink and snowsports lovers and surfers great joy. So thank you Creator, Father Sun and Sky, Mother Earth, the Ancestral and Nature spirits, and communities for the needed moisture. I have seen for 19 years how Mother Earth is even more generous when we give Her thanks for Her priceless gifts, after a Lakota, Daniel “Rollingbears” Quintana, shared this Ancient wisdom with me in Telluride. Giving gratitude for the “gentle” snows and rains helps manifests ideal conditions. The following thank you note that Bobcat sent Olivia and me made me realize that many of the great communities and minds of the planet, including Stanford’s Nobel Prize winner Dr. Stephen Schneider, UN’s Sustainability officer Maria Mercedes Sanchez, and 14 yr old World Youth leader Xiuh Martinez (see his TEDx plea to adults), are either cheering on our Native ski programs and snowdances, or we are supporting their ceremonies. Fifty years ago, JFK urged Americans to study the ancient wisdom of the tribes and heal our national wound. Other ways he is helping restore precipitation cycles is by serving on the Board of Lomakatsi Restoration Project (means Life in Balance) preserving a powerful California tribal sacred site and repairing Northern California’s land, river, and trout by giving jobs to the Pit River Tribal youth. For more info, click here. Hail to all those who are helping our great civilization and sport to go on for the benefit of all of our children, by finding many more creative ways to make skiing be sustainable and affordable. PHOTO CAPTION: Tahoe Olympians and community thanked Lois Kane and her Eagle Wings Pageant Dance Group, descendants of the dancers who saved the 1960 Olympics, during Tahoe’s 2012 drought, and they again saved them with a snowdance. Photo courtesy Lois Kane, language-dance coordinator, Powder Magazine, November 2014. Californians can be proud that America’s first cross-cultural snowdance magnanimously led by Washoe, Shoshone, and Paiute dancers, saved their 1960 Squaw Valley Olympics. (Also see P. 13 of next link). As co-founder of NAOTF, I have organized or participated in and witnessed about 40 Elders-led snow miracles over 20 years. To learn more, click here and here. We found in states like Colorado when two or more ski areas host gratitude snowdances, it creates weather systems that benefit the whole region. Plus a climatologist reported that Vail’s Jan 7 2012 Snow Ceremony, led by the beloved Southern Ute Elder Eddie Box Jr., magically opened the door in their weather systems so the snow laden clouds didn’t pass them by like others have. “The amazing thing is that it actually worked,” said WSJ’s Ben Cohen, and they enjoyed powder skiing the next day. See his Wall Street Journal video and story. Ski areas who invite their tribal youth to share the joy of skiing in their ancestral lands are blessed with some of the highest snowfalls in their states, thanks to many giving tobacco with gratitude prayers for Mother Earth’s snows each time they come. Bobcat is exploring how to establish ongoing affordable tribal ski programs for nearby tribes. He hopes this inspires others to partner with him or NAOTF to help facilitate more Pacific Coast ski areas to become part of the healing of the land and weather through healing hearts and starting a joyful new beginning. 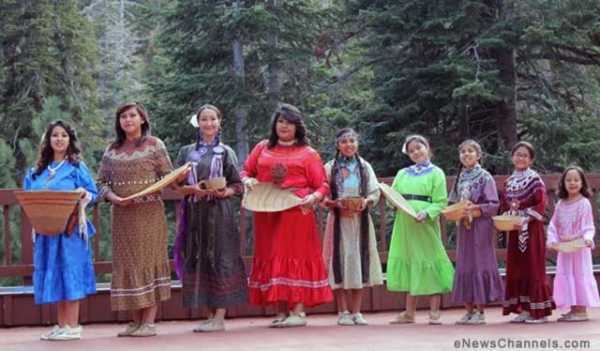 Sipapu’s NM-AZ Native Program Helping Heal America. “The unprecedented threat of climate change is bringing us together, and the snow mountains of the world are a powerful place to focus healing,” said Bobcat. Article is Copr. © 2014 by Suzy Chaffee and originally published on Ga-Ga(com) – a publication of NEOTROPE® – all commercial and reprint rights reserved. Opinions are those of the author and may not reflect the opinion or policy of this site or its publisher. Content has not been edited in order to retain the author’s unique voice. For questions about this article, contact: Suzy Chaffee, at NAOTF.org. All images were used with permission of the rights holders. Suzy "Chapstick" Chaffee Bio - as first woman on the USOC board in the 70s, she led the successful reform of the Olympic Rules with Legends like Bill Bradley, Muhammad Ali, Jack Kelly, Kip Keino, which leveled the playing fields with the government supported countries through Madison Ave, then led the Title IX March in DC. In 1996 she co-founded the Native American Olympic Team Foundation that has inspired ski areas across the US and Canada to invite tribal youth to share the joy of skiing with over 10,000 youth, which inspires their Elders to lead snowdances that have saved ski areas from droughts for 55 years. At the request of SLOC, she orchestrated a snowdance that restored their snow and also a Native ceremony with Ali, that protected Utah from expected terrorism, and every Olympics since then, including RIO!